We say snack but it can be eaten as a meal, and it doesn't take long to cook. We love the crispy edges of the potato slices and soft inner piece just makes the perfect combination for those day when you want to make something quick but tasty. We don't think we have ever seen this snack in any Indian restaurant and this recipe is very unique and most likely you will not see it in your average Indian recipe books. In a bowl add all the ingredient with a little water to make a paste leaving the cumin seeds, asafoetida, garam masala and coriander out. This method is to prevent the dry ingredients burning. In a heavy non stick pan heat the oil on a medium flame. Add the cumin seeds until they start to release their aroma. Add the asafoetida. Turn the heat down. Take a lid ready to cover, put the paste mixture and add to the pan and cover. Stir the mixture add the sliced potatoes stir well cover and cook on medium to high heat. Stir occasionally. 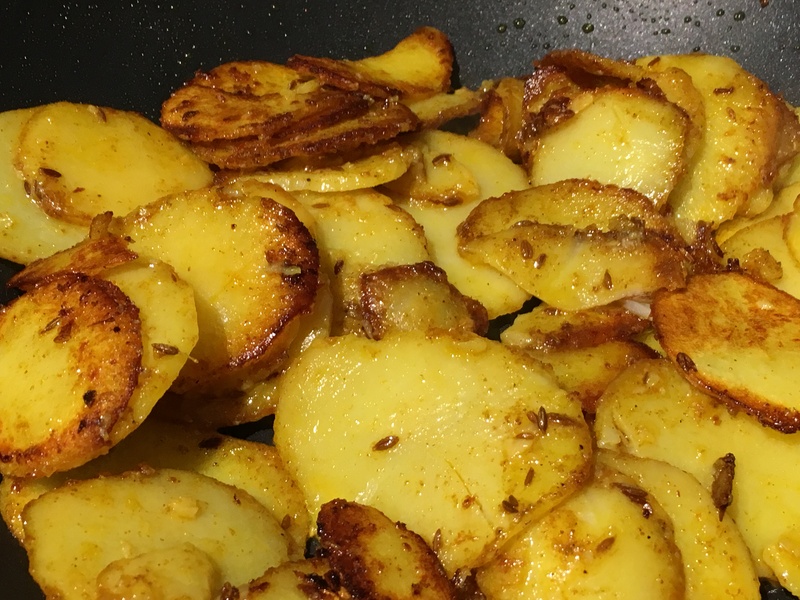 If you like the potatoes crispy uncover and cook on a high heat until tender. Finally add the garam masala and sprinkle the coriander leaves. This can be served with Chapattis, or Hot plain puris. We say snack but it can be eaten as a meal, and it doesn’t take long to cook. 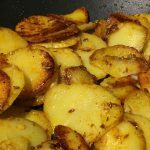 We love the crispy edges of the potato slices and soft inner piece just makes the perfect combination for those day when you want to make something quick but tasty. We don’t think we have ever seen this snack in any Indian restaurant and this recipe is very unique and most likely you will not see it in your average Indian recipe books.